Gather waxed crayons, wooden crayons, markers, and pastel crayons. Prepare a few bottles of glitter glue. Gather waxed crayons, wooden crayons, markers, and pastel crayons. Prepare a few bottles of glitter glue. Simply add pastel-coloured glitter to white glue. Add small containers filled with Easter confetti and stickers, feathers, cotton balls, and a different types of paper (tissue, crepe, metallic, cellophane). Crack the top part of an egg shell. Empty it and wash the shell thoroughly. Decorate the shell with markers or paint. Glue the decorated egg onto a plastic bottle cap. Garnish with flowers. Cut an egg shape out of "Mac-Tac". Stick small squares of tissue paper on the egg. Even young children love this activity! Paint on a sheet of paper using pastel colors. When the paint is dry, cut egg shapes. Trace an egg shape on paper. Paint the egg with chocolate pudding paint (one pudding envelope with one cup of milk) or Jell-O paint (one Jell-O envelope with a small quantity of water). Draw an egg shape on cardboard. Use markers or crayons to add details such as eyes and a mouth to create a character. Decorate an egg-shaped Styrofoam ball. Cover it with glue and roll it in sparkles. Dip eggs in Carnation milk to which you have added a few drops of food coloring. Allow to dry completely. The eggs will sparkle. Cut an egg shape out of a Styrofoam platter. Carve the inside using a toothpick to make designs. Cover the egg with paint and use it to make impressions on paper. Trace and cut eggs out of coloured construction paper. Cover the eggs with glue and sprinkle with coloured sugar or salt. Use egg-shaped sponges dipped in paint to make impressions on paper. Draw legs. Add "Cheerios" for eyes and a piece of macaroni for the beak. Finally, add feathers and children will have little chicks. Cut an egg shape out of a piece of white cardboard. Mix glue with food coloring in bowls. Use these mixtures to paint the eggs. You can sprinkle with salt or sugar for added shine. Soak eggs in coloured hot water for half an hour. 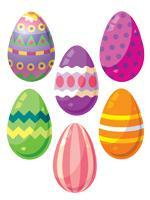 Children can decorate the eggs using markers or waxed crayons. Use empty rolls of toilet paper cut into small rings to hold the eggs in place. Insert a popsicle stick in the end of a Styrofoam egg. Dip it in glue and then in coloured sand or salt. Make eggs out of clay. Paint them and add ribbon to hang as decorations. (Open Model - Egg shape) Print one egg for each child. Children cut them out and glue them onto a piece of construction paper. As a group, they can create an egg family and use their eggs for puppet shows. Color or paint an egg yellow. Glue a triangle cut out of orange construction paper as a beak. Add wiggly eyes. Cut strips of red and orange construction paper and curl them with scissors. Glue them onto the egg. Glue straw under the egg and deposit it in an egg carton. Print the egg shape. (Open Model - Egg shape) Have children make an Easter drawing inside. Dye egg shells with food coloring and use for crafts. Cut a potato in half. Since potatoes have an oval shape like eggs, they are perfect for stamping Easter eggs. Use pastel-coloured poster paint. Trace eggs on waxed paper using cardboard eggs. Cut them out. Deposit waxed crayon shavings between two egg shapes. Iron the eggs with a hot iron. The final result is superb! Cut out egg shapes. Decorate both sides of the eggs. Punch holes in the eggs and hang them as a mobile using string. Draw an egg on construction paper. Cut out and decorate the egg. Cut the egg in two following a zigzag instead of a straight line. Cut a chick out of yellow construction paper. Glue the chick to the back of the bottom egg shell. Attach the upper egg shell with a fastener. Children will love making their chick hatch. Cut an egg shape out of construction paper. Fill a bottle with a mixture of flour and water. Add a few drops of food coloring. Prepare several bottles with different colors. Decorate. Have children crush egg shells. Glue them on a picture and paint afterwards. Allow hard-boiled eggs to cool. Children draw on the egg shells using waxed crayons. Combine: 1 tablespoon of vinegar, 1 cup of hot water, and 1 teaspoon of food coloring. Prepare different colors. Dip eggs in the solution and let dry. Smear the eggs with vegetable oil for added shine. (Open craft - Bunny face) Print for each child. Have each child paint a paper plate. Have them cut out the eyes, nose, mouth, and bunny ears. Children glue the pieces on the paper plate. Decorate the ears with cotton balls. Sprinkle sparkles on the cotton balls and staple the ears to the top of the plate. (Open craft - Big bunny) Print for each child. Assemble using fasteners. (Open craft - Bunny costume) Print and cut out. Children color the bow tie and wear it around their neck using a long string. Paint a paper plate for the bunny tail. When dry, glue cotton balls in the center. Attach string to either side to tie the tail behind children's back. Cut a strip of paper for each child and staple to form a headband. Glue cotton balls to the headband. Color, cut out, and staple the bunny ears to the headband. Use the costume to hop like bunnies to the sound of music. Use two paper plates, a small one for the head and a larger one for the body. Draw eyes, a nose, a mouth, and moustaches on the smaller plate. Glue two bunny ears to the top of the plate. Attach the head to the body. Cut out four bunny paws. Glue two paws under the head and two paws at the bottom of the bunny. Add cotton balls to the back of the plate to represent the bunny tail. Have each child cut out a bunny. Apply glue and add cotton balls. Color the mouth, nose, and eyes. Glue pipe cleaners for the moustaches. Add a few drops of food coloring to whipped cream and paint a giant bunny which was previously traced on a piece of paper. Give children bunny outlines and have them fill them with cotton balls. Variation: The bunny outlines can be on cardboard or "Mac-Tac". Draw a bunny face on a paper plate. Add ears and glue a popsicle stick to the base for children to use as a handle.Variation: Use a brown paper bag to create the puppet. Draw the face on the front. Add ears and pipe cleaner moustaches. You can complete with paws on either side of the bag. Use an upside down Styrofoam glass. Draw a bunny face on the front of the glass and add pipe cleaner moustaches. Add ears to the top of the glass. 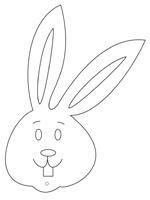 Create a bunny from a footprint. Trace the contour of children's feet on white sheets of paper. Cut two long ears out of pink paper. Glue the ears to the heel. Glue a pompom on the part of the foot where the toes are to represent the nose. Decorate with markers and paint. Add pipe cleaner moustaches and wiggly eyes. Make a bunny's head from a handprint. Trace the contour of children's hands on pink construction paper and cut out. Remove the thumb, middle finger, and ring finger. Draw the face. Cut a potato in two and make a print on paper for the bunny's body. Cut a carrot in two length-wise and make two prints to resemble ears. Use the tip or a slice of the carrot to make the eyes and nose. Use a black marker to add the mouth and moustaches. You can add green straw to make it look like your bunnies are playing in the grass. (Open craft - Chick) Print one sheet per child. Cut out the pieces for the chick's face and set them aside. Trace circles on a yellow piece of construction paper and cut them out. Cut one of the small circles in half and use the half circles for wings. The other small circle will be the chick's head. The largest circle will be for the body. Have children complete the chick's face with the pieces. Glue the face on the larger circle (just enough for it to stay put). Next, glue the legs to the body. Attach the wings to either side of the body using fasteners. The wings will move up and down. It will look like the chick is flying. Use two paper plates. Cut one plate in half using a zigzag line to make it look like a cracked egg. Paint the entire plate yellow or orange and the half plate white, like an egg shell. Glue the half plate to the complete plate (so that there is room to place something between the two plates). Have children draw eyes using a black marker or glue wiggly eyes on the chick. Cut an orange beak out of construction paper and glue it to the face. You may add feathers. Make a small hole at the top and thread string through to hang. Use this "basket" for a special Easter treat. Trace the outline of a hen on cardboard and cut it out. Glue it on cardboard of a different color. Add coloured feathers to the outline. Add a small cardboard egg to make it look like the hen is laying an egg. Cut a paper plate in two. Cut three triangles out of the top of the plate to make it look like a comb. Paint the plate yellow. Make holes on either side. Tie yarn. Cut a small orange triangle and glue it to the bottom of the plate to represent the chick's beak. Trace children's hands on paper. The thumb will be the chicken's head and the fingers will represent the feathers. Add a beak, an eye, and legs. Use an egg carton cavity as a nest. A yellow cotton ball makes the perfect chick. Simply add a beak and eyes. Cut out the chick shapes. (Open models - Chicks) Children add details and multicoloured feathers. The chicks may be glued to a popsicle stick to make puppets. Draw a head, two wings, and a tail on construction paper. Glue feathers on the wings. Cut part of an empty toilet paper roll to hold the chicken. Make slits at either end of the toilet paper roll. Insert the head in one slit and the tail in the other slit. Decorate the roll. Glue the wings. Cut thin strips of yellow construction paper to make straw. Place the chicken on the straw. (Open craft - Easter basket) Print two copies. Cut out and color. Fold where indicated and glue the contour of the basket. Use one end for the interior and one for the exterior. Attach a cardboard strip to make a handle. Add the Easter designs to the basket to decorate. Clean an empty 1 litre carton of milk per child. Cut the container one quarter way up. Make two holes on opposite sides using a hole-punch and thread a pipe cleaner from one hole to the other to make a handle. Decorate with fabric, paper, and paint. Add ribbon to the handle and make a bow. Lay straw in the basket and use it as you wish. Decorate an egg carton with pastel-coloured paint. Add stickers, sparkles, and sponge impressions. Before closing the egg carton, add chocolate or plastic eggs. You can add ribbon and make a beautiful bow. (Open Garland - Easter) Cut out the garland models. Place them on folded sheets of paper and cut out the shape (do not cut the edges). When you unfold the paper, the shapes will form a garland. Let children decorate hollow eggs using the technique of your choice. Cut a toothpick in two. Attach fishing wire (knot) around half the toothpick. Insert it in the hole to hang. 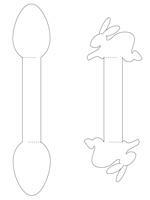 (Open models - Easter) Print, cut out, and glue to a string. Use Easter colors for both the string and the construction paper. (Open models - Different sizes of eggs) Print, cut out, and glue to a string. Use Easter colors for both the string and the construction paper. Draw several eggs on construction paper. Cut out and decorate. Glue the eggs to a strip of construction paper to make a beautiful Easter crown. (Open models - Easter) Print the shapes. Children must tear, crumple, and glue pastel-coloured tissue paper to the shapes. Purchase a white paper tablecloth. With your group, glue tiny squares of pastel-coloured tissue paper, multicoloured egg shapes, and ribbon to the tablecloth. You will have a beautiful tablecloth for your Easter celebration. (Open craft - Easter napkin rings) Print and cut out of cardboard. Decorate with stickers or sparkles. Make incisions in each extremity and insert them one inside the other. Slide a napkin into the ring. Cut a piece of paper large enough to wrap an empty toilet paper roll. Fill the toilet paper roll with candy or another Easter surprise. Roll it in the paper. Tie each end with ribbon. Cut the top off a 1 or 2 litre milk carton. Paint the entire surface or cover it with construction paper. Do not wrap the top. Add glue, sparkles, and tiny egg shapes. Staple ribbon on either side and use it as a handle. Deposit an Easter surprise inside and cover it with tissue paper. Give each child a shoe box. Let them paint or cover their box with Easter paper. They can place one of their Easter crafts inside their gift box. 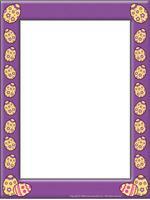 (Open model - Easter frame) Print and glue the frame to heavy cardboard. Take a picture of each child. Glue the picture inside the frame. You may wrap each child's picture in a shoe box. Add straw and chocolate eggs. What a magnificent gift! (Open greeting card - Chick face) Print one chick per child. Reproduce the design on construction paper or heavy cardboard. 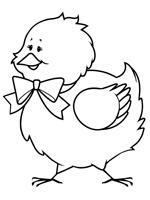 Children can color their chick or decorate it with feathers, etc. Cut a slit on either side of the nose using an "Exacto" knife. Be very careful. The nose must remain on the chick. Write a brief message for the child or add a rolled up drawing. Insert the rolled up paper in the opening. The chick holds the message or the drawing in his beak. Collect broken egg shells. Prepare several different colors of food coloring in small plastic containers. Dye the egg shells using a few drops of food coloring diluted with warm water and a few drops of vinegar. Remove the egg shells from the dye and set them to dry on paper towels. Print Easter greetings (Open memo - Easter greetings). Glue the greetings on pastel-coloured construction paper. Fold the paper in two. Children create a mosaic on the front of the card using the egg shells and glue. Allow to dry. (Open cards - Easter) Make an egg-shaped Easter card. Use two tablespoons of cocoa, 2 tablespoons of white sugar, and 1 teaspoon of unsalted butter. Combine and heat in a double boiler until the mixture is smooth. Mould and set aside to harden. Wrap the chocolates in pretty paper. (Open decorative box) Print and trace the model on construction paper (one per child). Cut and assemble according to the pattern. Let children decorate their box as they wish and deposit chocolates inside. Add decorative ribbon.